Our own private formula, Advantage Blue Carpet and Upholstery Cleaner, has been Proven over generations of use. Carpet cleaning is in our blood and after cleaning millions of feet of carpet, not finding a pre-spray that cut through the grime, we developed our own. Our pre-spray saved us time and money spent on spotting chemicals and spot cleaning! And now we are offering it to all carpet cleaners to save you time and money too! Advantage Blue Carpet and Upholstery Cleaner is the pre-spray that works! It is a proven carpet and upholstery cleaning pre-spray that take the problems out of cleaning. It contains a pleasant citrus fragrance that leaves behind a fresh and clean smelling room. Because of the effectiveness of Advantage Blue Carpet and Upholstery Cleaner, you will find your self using less spotting chemicals, saving you time and money! Feature: Contains 4 Different Detergents. Benefit: Gives product versatility to work on many types of carpets, and to clean up many types of dirt, spots and stains. Benefit: Removes oily-greasy stains & leaves a fresh citrus aroma. Benefit: Free rinsing-no residues left behind to promote re-soiling. Feature: Moderate to low foam. Benefit: No need to use anti-foaming agents. Benefit: Safer to the Environment. Advantage Blue carpet and upholstery cleaner gets results! You can count on it to remove dirt, grease, and body oils from carpet and upholstery. Plus, it leaves a pleasant citrus fragrance. 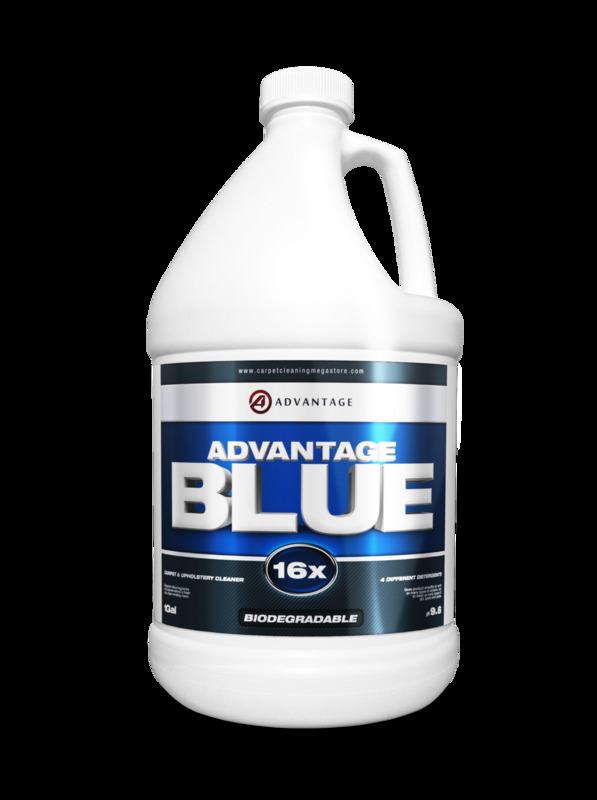 Advantage Blue works better than your current carpet and upholstery cleaner. Don't believe me? Try it! We stand behind our products with a 100% money back guarantee. Test the product in 2-3 homes, if it doesn't out-preform your favorite prespray, return the remaining chemical for a full refund. Works with multiple cleaning systems such as: Truck-Mounted units, Portables, and Bonnet Cleaning. • Removes Most Spots without an additional spotting cleaner! As with all presprays, be sure to always test for color fastness before using Advantage Blue. In a pressure sprayer, mix 8 oz. of Advantage Blue Carpet and Upholstery Cleaner with 1 gallon of water. Spray lightly over an area to give the chemical a 3 to 5 min dwell time. For spots and heavy traffic patterns on carpet, apply a slightly heavier spray. Agitation with a brush or rake may help. For best results allow a 5 minute dwell time. For optimum cleaning and brightness, we recommend an acid rinse. In a pressure sprayer, mix 6 oz. of Advantage Carpet and Upholstery Cleaner with 1 gallon of water. Spray lightly over an area approximately 12x12. For spots and heavy traffic patterns on carpet, apply a slightly heavier spray. Brush or rake heavily soiled areas. Wait five minutes and dip a cotton bonnet thoroughly and spin drop on sprayed area. Place floor machine with pad holder on top of pad and make 2 to 4 passes. Turn pad over when dirty. For best results use only clean pads with each pass. Please see the bottle of Advantage Carpet and Upholstery Cleaner for more detailed information.